The previous one stayed for only 3 days, but as I was building it I knew it wouldn’t stay for long, I just wanted to change it quickly, and also learn how to work with S2. I finally figured out the wonders of what S2 and CSS can do together, it’s amazing and much more flexible to work with them, I wish I had changed it earlier (but even if I wanted I wouldn’t have the time). Another good thing of working with this new design architecture is that I don’t have to worry about making wallpapers anymore (it was too much space to fill, honestly xD). Working with banners opens whole new design possibilities and I’m already having different and challenging ideas for my future layouts. I chose this Tsubasa picture basically because of two reasons. The first reason is that I really like this illustration, I intended to use the Syaoran from this picture on my confessions on a dance floor Tsubasa layout xD But as I know I ended up not using it. The other reason is that this was the first Tsubasa illustration released to the public right after the series was announced, and since we are reaching the end of it after these 5 long years, there’s this nostalgic feeling around it. Despite of being the very first Tsubasa illustration released to the public, it’s amazing how the art style hasn’t changed at all. If you look at the early illustrations of CCS or Rayearth, for example, and compare them to latter ones, you’ll notice significants improvements in CLAMP’s art. That doesn’t seem to be the case here. I know there isn’t anything extraordinary in this layout, but again, due to time issues I wasn’t able to do anything extraordinary xD I promise, though, that I will push the edge further on my next layout. This little flash application is placed on a fixed post on my livejournal and it shows the upcoming CLAMP releases (merchandises, events, media appearances etc) and the manga schedule for their current series, as a quick way of checking what’s coming next from CLAMP. 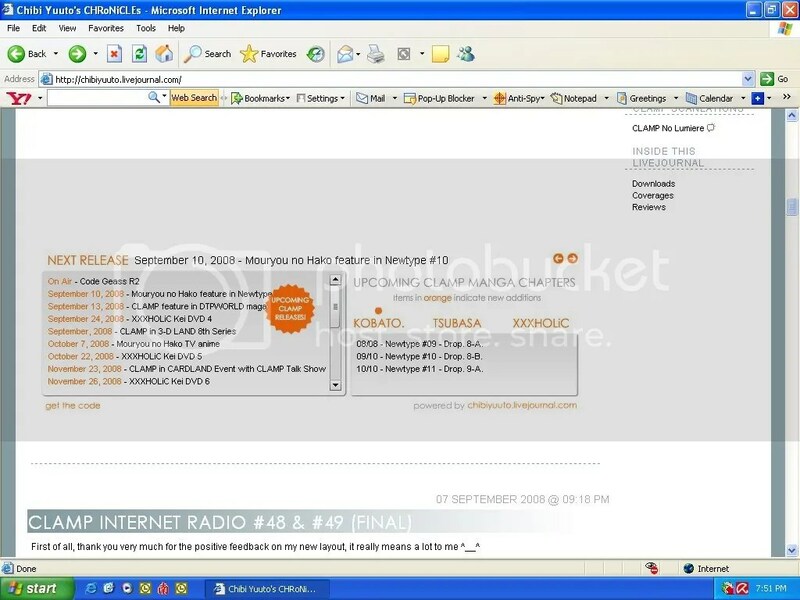 The design was strongly based on CLAMP-NET.COM’s current design, as you could possibly have noticed. You can also incorporate it into your own blog, website or anywhere else you might want to add it, and the information on it will be automatically updated from whenever you have placed it. So browse around, welcome to this new chapter of my livejournal, always aiming to keep you up-to-date about CLAMP and their activities. That thing is, like, the coolest thing ever. ö_ö Neko Seishirou approves! Feel free to use it~! And the ‘CLAMP Widget’ you created is plain amazing! x__x You are really good with coding!!! Wahh, thank you so much for your compliments! Thank you! *bows* It really means a lot to me! Thank you a lot Kiki-chan. I saw your huge Sakura staff, that is so WOW xD Congratulations! 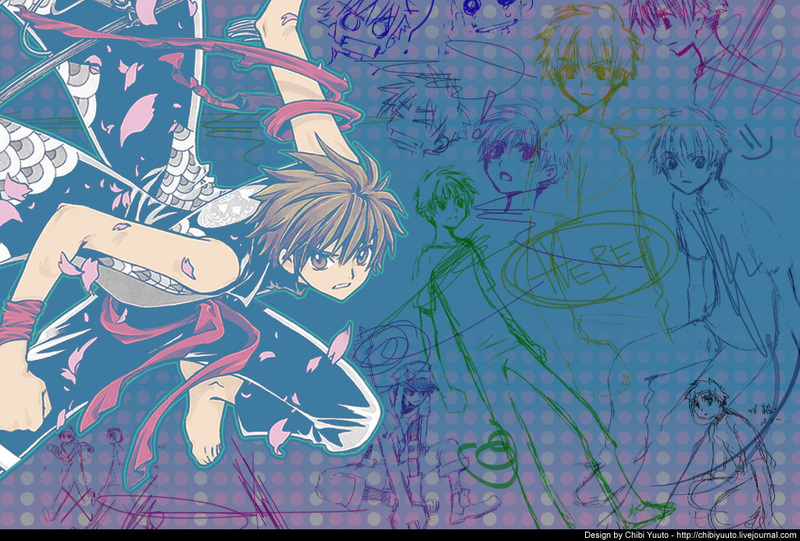 By the way, I gotta tell you, Syaoran is such a great icon-model. Wow! it’s so pretty, i really like it! Wow, it’s fantastic! Great job! Glad that you liked it, thanks for your feedback!! Thanks for the compliments on my new layout too, very kind of you. The widget is cool, but I think it might be better for wider screens… it keeps pushing the content section way down on my computer and leaving a giant gap from the header. Thank you Kaeyko-san, that means a lot to me! Humm… indeed. It’s quite large (almost 700 px). I was worried about that, I tried to make as much compact as possible. I only checked it with 1024×768 resolution on Internet Explorer and Firefox, and it looks good on both. What’s the resolution and browser you’re using, do you mind telling me? Hmmm… I’m using 1024×768 on IE. eeeeehh o.o IE 7.0 or earlier? Ah, so that’s probably the reason. I’m using IE 6 because I have stubbornly refused to change to 7. Could you please take a screenshot from the lower part of the sidebar? Basically where the posts “begin”? I think I might know the problem. I’ve tested it in a machine with IE 6 and indeed the problem is there. Great! ^__^ Thanks for your help! I noticed your nickname in your forum is Keane, is it because of the band? WOW~~ You new layout is SO amazing!! ^O^ Especially with the little “update” news section right at the top!! Very convenient,good references and very neat features!! ^___^ You are truly living your reputation as “Chibiyuuto: The key informational person for MOST UPDATED news and releases about CLAMP”. You designing and programming skill are amazing!! Great layout, simple but nice. The widget is made of win! Just a curiosity: how do you fetch the data for the releases? Do you put them in the .fla and regenerate the .swf everytime there is an update? >how do you fetch the data for the releases? Do you put them in the .fla and regenerate the .swf everytime there is an update? Congratulations for your new layout! I have only made a couple of comments through the years, but I have been a fan of your livejournal for a long time. The new layout looks very neat and professional, and the widget is really cute and useful. PD: I miss your comments on TRC and XXXholic chapters. >PD: I miss your comments on TRC and XXXholic chapters. The widget _is_ wicked cool. I might do something like that for my tv show viewing schedule. >I might do something like that for my tv show viewing schedule. It looks really nice, and I love your idea of the flash aplication, I think I will add It to my journal, crediting you of course!! Nice job! Your layout looks fantastic and I ADORE YOUR WIDGET!!! It looks so cool + shiny!!!! I envy your design/programming/CLAMP-ness skills!!! So cool! It looks really professional!! ‘Legal’ as my brazilian friend says XD. I know you’ll go “O__O” at me, but can I express here all my compliments to you for this neat new layout and the amazing widget? Your skills improved a lot, and that thingy is so useful!! No more going crazy to check if a new chapter is coming out or not, hehe! I was impressed, and if I’m writing it here you know I MEAN it! XD chuuu! P.s. indeed that illustration puts a great amount of nostalgia on me, we’re reaching the end.. Wow!! you absolutely changed your webpage. I’m still used to the previous one, but I hope I get used to this one really fast. I have to admit that it has style. I actually like it more that the first one. Seems more mature, more formal, more elegant. I previous one you put before this, a couple of days ago, in yellow seemed to childish. In some way I’m glad you changed it before this one is better. One of the differences I notice also between this modern version and the first one is that the wallpaper is about Tsubasa now(which I love) instead of Sayaka from Kobato. So the change is better! The new layout seems so professionnal, it’s amazing. And the CLAMP Widget…you’re a genius ? So I’ll look for your site more than ever ! Great job ! Very cool ! Fantastic new layout Yuuto-san! So swish and flashy with the interactive box at the top! I love it! A wonderful design, and the CLAMP widget will be useful!! Thanks for your hard work sharing CLAMP love! Wow, congrats on the new layout, I like it a lot! and the widget is VERY VERY useful!!!!!!! i love it chibiyuuto sama!!! i’m comeback from the ill and very busy island!! i can ask you how one possible change it into spanish??? is possible??? the events one at least??? i love to have it!!! can i?? Were you ill? Are you alright? Thanks for your imput! More suggestions are welcome! yes i was very ill for the past 4 months i been diagnosticated with high blood pressre, hypothidoisdm, plus my diabetes, so i had a really bad time, now i have new medication working at last and i’m better, but i hate takeing so many pills for my entire life!! Oh I’m so sorry to hear about your illness, I hope you get better =/ Indeed it’s much better to take the medication, even though it must be painful to do so. Wow! You never stop amazing me with your skills. The lay looks wonderful, I think you’ve done a great job.